Fresh, summer cucumber top note, lingering refreshing note on taste with excellent smooth delivery. Crisp but without excessive bite. Clean finish. Made by re-distilling Blackwood's Vodka over a tray of sliced cucumbers. Some additional natural cucumber oils added if needed to balance seasonal variation in flavour. All cucumbers are sourced in the UK and redistilled in Scotland. By spring 2007, all cucumbers will be grown in the Scottish Highlands. 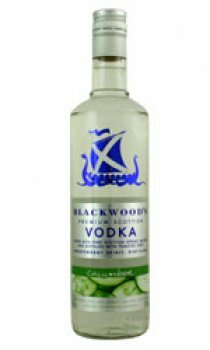 Blackwood's Vodka itself is 100% Scottish and the winner of 4 awards including the San Francisco World Spirits Competition and World Spirits Festival. A high quality base spirit - triple distilled wheat, allowing smooth alcohol taste in either cocktails or long drinks.